Mavis or Joan, Huff or Mathews, you may very well find your name on a page of this book. My goal was to tell my story like it is, from my perspective. I did not intend to embarrass or expose anyone, but I have. For the most part, my younger life parallels millions of others from what is now called “the greatest generation.” We are on our way out now, but because we’re tough, many of us are still trying to be useful, to contribute something. We were “designed” to take care of the tasks of our generation, reaching adulthood in the throes of World War II, filled with patriotism and hope for the future of the greatest nation on Earth. It is only recently that all of those molds have been dissolved in a determined effort to express individuality; some say it’s the Aquarian Age. But relatively speaking, I broke the mold pretty early on. I climbed a forbidden windmill and ate of forbidden fruit when I was six. The most daring thing that I ever did was to break away from the Baptist church at seventeen and later to proclaim myself a new age thinker when I was twenty-eight. I will share with you what drove me to that decision and go on to prove that it was only a beginning." 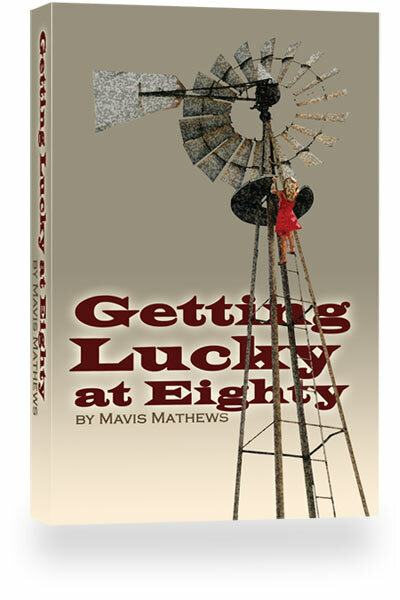 “Getting Lucky at Eighty,” a fast-moving autobiography by Mavis Mathews is an easy and inspiring read. Originally intended to be shared only with the four boomers she raised, a powerful and dramatic realization of the advantages of turning eighty years old in 2006 changed all that. The decision to publish this very candid and intimate story of her life came with that new perception of aging. She has never been happier, never been more grateful, or more accepting of herself and of life as it continues to unfold. Aging is the final stage of living. Why can’t it be the best part? The dessert? This new release offers hope and inspiration. The true life story begins on a farm in Oklahoma where she is born with excessive energy and excessive expectations. She excels in school, graduates from a private broadcasting school and becomes an NBC newscaster at twenty-two. Later she marries, bears two sons and two daughters which she ends up raising by herself. She never stops moving from place to place; she loves too much and eventually conquers deadly pride, but it was her search for God that has dominated her life. This is a spiritual love affair. Mathews still sells real estate, plays bridge, is an active Toastmaster, and an enthusiastic writer of thought-provoking articles which she calls “think pieces” and intends to publish. She has lived on the Mendocino coast in Northern California since January of 1995. “Getting Lucky at Eighty” (ISBN 1-4251-1276-5) is an 8” x 5” quality soft-cover book printed on demand by Trafford Publishers in Victoria, Canada, www.trafford.com It can also be ordered at www.amazon.com, at your bookstore, or right here buy clicking the “Buy Now” button.